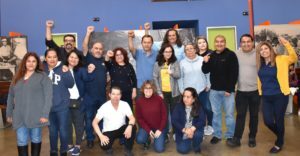 On Jan. 20, members of UFCW Local 770 who work at Overhill Farms in Vernon, California, ratified a new contract that raises wages and improves benefits. This ratification comes after 18 months of contract negotiations, three strike votes, and various actions demanding respect, dignity, and a voice on the job. Effective from September 2018 to September 2021, the new contract benefits around 400 employees in the bargaining unit. It includes wage increases of up to $2.00 per hour during the contract term, according to seniority (a base salary greater than the minimum wage will rule). The employees will also receive retroactive back pay to Sept. 1, 2018, and a sizeable bonus paid within 30 days of ratification. Regarding health insurance, the company will establish a fund to reimburse deductibles to employees who are currently enrolled in the company’s health care plan – up to $900 per year for employees with single coverage and up to $1,200 per year for employees with dependent coverage. Grandfathered employees (including covered family members) will receive reimbursements of some copays (up to a total of $50,000). The contract also guarantees no annual increase to weekly medical premiums for the life of the contract. UFCW 770 members won a guarantee that the company cannot unilaterally change the health care plan, as it had done in the past. Overhill Farms committed to paying up to a 12 percent increase per year and maintaining the same health benefits. If the increase exceeds that amount, then the union can offer another, more cost-effective plan, which the company must accept or pay the entire increase itself. During contract negotiations, the bargaining committee and rank-and-file members stood strong fighting for better living wages, affordable health benefits, seniority protections, a safe workplace, and dignity and respect. Community, labor, and faith leaders joined the workers in solidarity at all the mobilizations in front of the company’s main plant. Overhill Farms employees are mostly immigrant workers who produce frozen food items such as plated meals, soups, pastas, sauces and other specialties. Overhill Farms is owned by CPF, a Thailand based conglomerate.